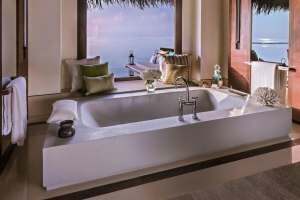 Escape into the lost paradise where the turquoise waters meet the clear skies at One&Only Reethi Rah. 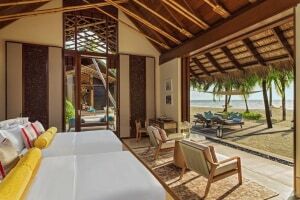 Being an all-villa property its laced with 12 pristine beach, elegant water and beach villas and a sophisticated residence for those grand getaways. 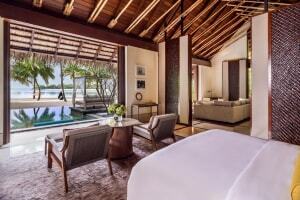 Tucked away on the largest island in the North Male Atolls, the property sits on a string of coral reefs, white sandy beaches and a beautiful lagoon. 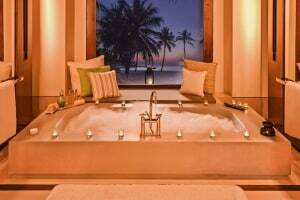 It is also crowned as being The Maldives first sun spa and the only PADI National Geographic dive center. 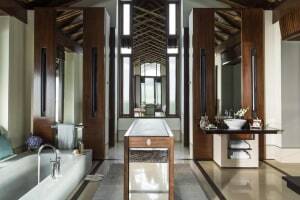 In addition, One&Only Reethi Rah is packed with a gorgeous infinity pool, tennis court and 8 dining options for satiate all your cravings, a luxury boutique and a library for the book lovers. Posh vogue with a hint of tropical verve. Dine wrapped around the chef’s garden as you sip on to finest wine and natural ingredients. Choose to sit amidst the colorful orchid garden or under the dappled shade of an ancient banyan tree, you will be offered with the unique experience to enjoy 100% natural food. The Botanic restaurant brings in the exclusive concept of field-to-fork cuisine where the natural produce is sourced from the land and sea grown around and the herbs and vegetables that flourish around your table. Bringing a mélange of French, Asian and Italian cuisine, the Reethi bring delectable dishes with a hint of innovation. The dining area is split into three different sections including – Earth, Fire and Aqua where the menu features an enticing collection of favorite dishes from around the world made from the finest ingredients. The breakfast here boasts an array of fresh bakeries, tropical fruits and healthy eats including superfoods. Kindly reserve your table for dinner only for theme night – Aqua Night which happens every Monday. Contemporary Japanese food served in tapas-style, the Tapasake brings a modern twist to the traditional dishes. Tapasake ensures that the sushi and sashimi meet highest standards while the small plate dishes are sprinkled with a burst of flavors that add an enticing flair to it. The dishes could also be accompanied with innovative sake cocktails or wine that includes Rieslings and Pinot Noirs to complement the food. Kindly note that reservations are required to dine at the Tapasake. Simple yet vibrant, the Rabarbaro Restaurant is always filled with soft hues of Italian aromas. The restaurant serves a variety of exquisite Italian dishes with a menu featuring some classic Italian dishes with a contemporary hint. With such delicious selection, the taste is sure to linger on your tongue for more than just your vacation. If you have any kind of dietary restrictions kindly let the staff know. Brining the taste of Middle Eastern to your Maldivian vacation, the Fanditha Restaurant promises nothing but magical dining experience. The chef curates a spread that reflects the taste of Middle Eastern cuisine. It allows you to relish some classic mezze from Syria, Lebanon, Morocco and much more. Gorge on some crunchy salads, delectable seafood and grills at the Beach Club for not only a lingering taste but a memorable dining experience. Encapsulated panoramic views of the Indian Ocean, the ambience is amped with chill-out tunes all the time for you to tap a foot or just unwind. You could also satiate your cravings with some snacks inspired by all-time favorite Latin American comfort food. Kindly note that the snacks are served only from 4:00 PM – 7:00 PM. Sitting right beside the main pool, the Ruh Bar welcomes all its wanders for a tasteful sip. The bar serves some exotic fruit concoctions to swanky cocktails all day that comes alive every evening with live music. The place runs with some cool martinis, tropical cocktails, sparkling champagne and a fine collection of rum. Kindly note that the afternoon snacks are served only from 4:00 PM – 7:00 PM. Literally meaning magical, the Fanditha Bar is tucked away along the shores of Indian Ocean. Set in a boho-chic ambience with plush divans and carpets envelops you into Arabian nights while you sip on to cocktails and wines while nibbling on exotic mezzes. Dunk in red as you relish on an exceptional wine experience at the Epicure. Home from 500 different labels and more than 4000 bottles famed from around the regions of California, Bordeaux, Tuscany, Australia and South Africa Epicure assists you to custom design wine experience with the help of an in-house sommelier. The place is open upon your request for your conivence. The hotel has three different swimming pool one for adults only, the other welcomes families and last meant only for the little ones. Maximum number of extra beds in a room is 1. Adults above the age of 12 are charged USD 492 per person, per night for extra bed.